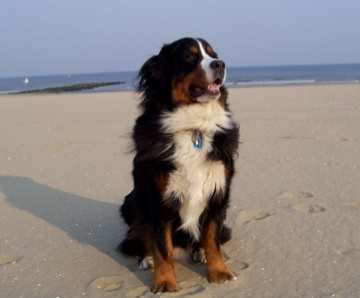 My colleague Barry has a Berner Senne who he takes with him to work, and this dog is truly amazing. Hobie just knows what you are thinking, and anticipates in ways that are even humorous at times. We are close friends, and when I eat some rice crackers I share some with him: a piece for me, and a piece for him. Barry warned, because he was afraid Hobie would develop some "begging behavior". I said, "no, don't worry, this is a friendship thing". Hobie patiently waits till it is his turn, he does not beg: it is just a fun thing to be able to "break some bread". And when I say that it's enough and I put away the crackers, Hobie simply gets up and goes about doing his other things. In my breaks I take him for a walk around the pond at the Dutch parliament. One day we saw some swans, Hobie stood still, looked at them with a curious stare, so I explained to him that swans are truly beautiful animals, very wise with a great capacity of understanding and communicating, but that they must always be approached very gently, because when they get upset they react very fierce for they are strong, so that they make bad enemies in a battle. Hobie laid down, to have an intense look at them, and wanted to find out about them it seemed. Amazingly enough, the swans swam nearer, and they were looking at each other for some 10 minutes or so. Every time after that, he would eagerly see if his swans were there, then sit or lay down to look at them, and he would even 'talk' a bit with them if they happened to be close by. One day Barry took Hobie to a nearby park, and he brought some bread to feed the ducks. There were two swans present as well, swimming about in the creek. Barry fed them bread. 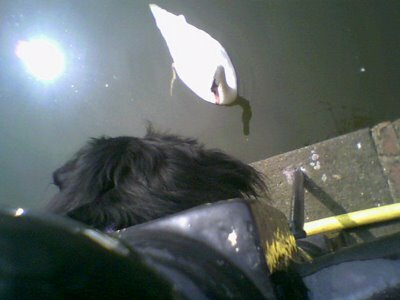 Then Hobie went into the water, very slowly, and Barry got a bit scared, called him back, but Hobie just looked back at him like: "Don't worry, I know what I'm doing", then posted himself in between the swans who were not afraid of him at all, and they took their turns of having a piece of bread. I believe Hobie understood two things I showed him, and from what he picked up he was able to have his own play with the swans, sitting in between them in the water "breaking some bread".